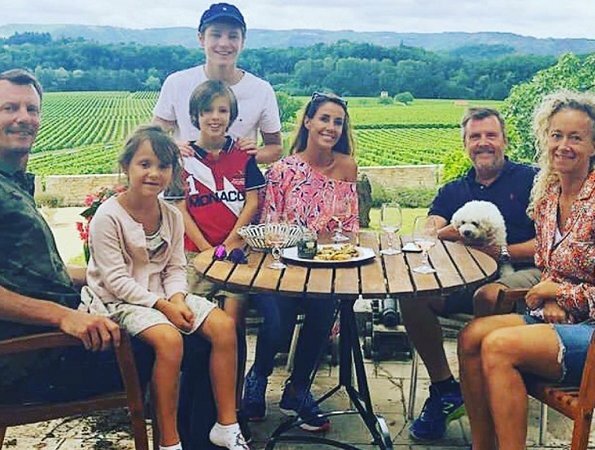 Danish fashion designer Charlotte Sparre shared on her Instagram account a holiday photo taken at Chateau de Cayx, showing herself, her husband, Prince Joachim and Princess Marie and the children Prince Felix, Prince Henrik and Princess Athena. Chateau de Cayx is the holiday house of Danish royal family. What a nice Holiday in France, wish I was there.Nice summer clothing,even a nod to Monaco,from Prince Hendrik. Very nice Family. Happy Holiday to everyone. Relaxing summer holiday with stunning views.